The firehouse was built and its surroundings landscaped in 1995. In the winter of 1998-9, a heritage oak fell, leaving a scarred, weedy hillside. 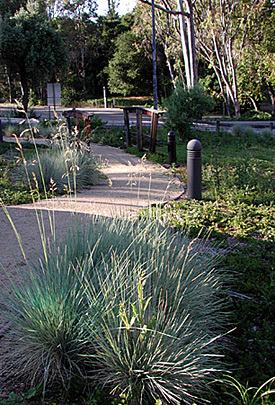 The fire department desired a showcase fire and drought resistant landscape. The site required that plant materials discourage deer browsing. The steep slope and existing decomposed granite path were eroding during winter rains. We used the steep slope as a design element, choosing two ground covers to suggest a stream flowing down the hill. 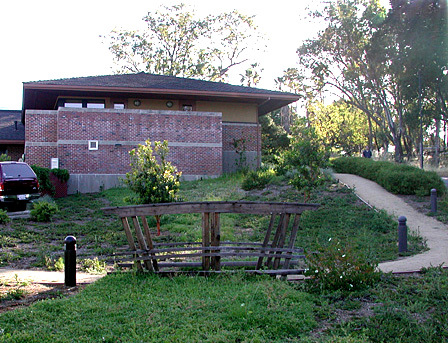 Where the "stream" crossed the path, we designed railings that simulate a bridge crossing. 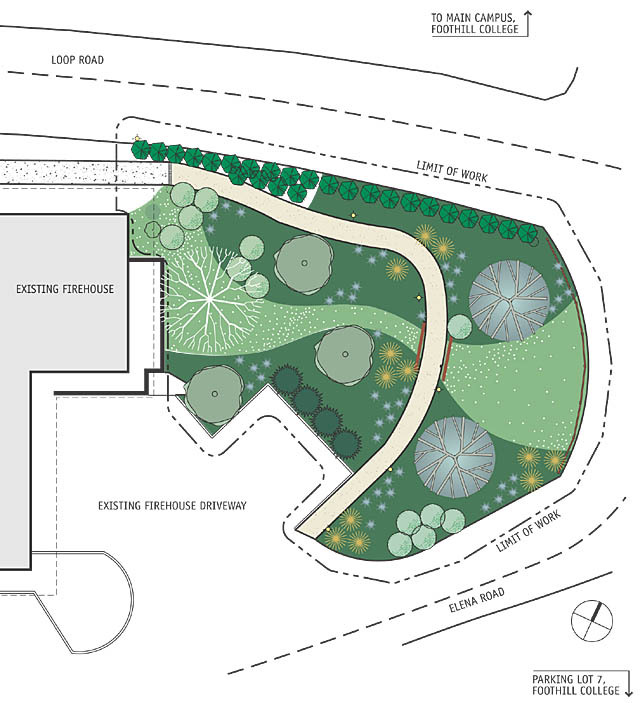 Images: landscape plan, view uphill to firehouse, view downhill to bridge, view along path. We continued a line of olive trees across Loop Road, planting two fruitless olives across the base of the slope to blend the new landscape with its surroundings. We rebuilt the path, adding drainage at the top to move water away from the path. We chose plants based on fire resistance, drought tolerance, and origin, using California natives where we could. Arbutus 'Marina' and Olea europaea 'Swan Hill' (fruitless olive). 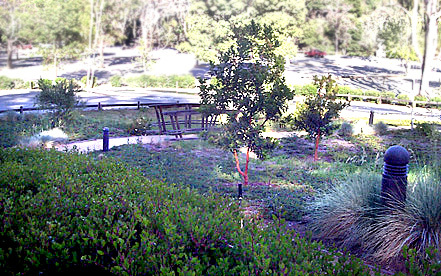 Rhamnus californica* (coffeeberry), Cistus ladanifer (crimson-spot rockrose), and Arctostaphylos densiflora 'Howard McMinn'* (manzanita). Calamagrostis 'Karl Foerster' (feather reed grass) and Helictotrichon sempervirens (blue oat grass). Delosperma 'Alba' (white-flowered iceplant) for the "stream" and Arctostaphylos uva-ursi* (bearberry).